Sean Dyche is relaxed about Ben Mee’s contract situation as he moves toward the last year of his current deal. Mee, who joined the club from Manchester City in the summer of 2011, initially on loan, is currently tied down until the end of next season. 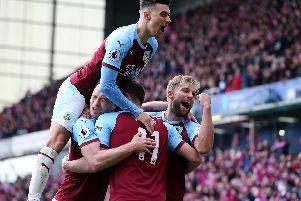 But, while James Tarkowski, Ashley Barnes, Stephen Ward, Kevin Long and Nick Pope - who all signed new terms this season, talks with Mee have yet to reach an agreement. The former England Under 21 international would therefore be available on a free transfer in the summer of 2019 as it stands, leaving the club in a situation similar to that they faced with Michael Keane last year, where they could have to cash in this summer. Asked whether he is concerned about the situation, Dyche said: “No, we’ve had it before. ”We deal with all the contracts, speak with all the players and their agents, we have open communication. “I’m never more confident or less confident than any player I’ve dealt with here.